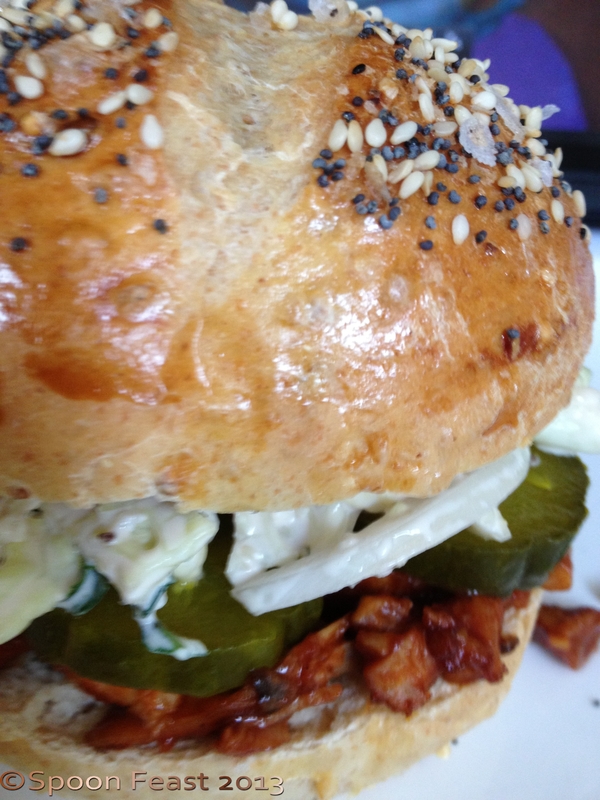 When it comes to a good easy sandwich roll, a homemade one is hard to beat. Finding a great recipe is also a bit of a challenge. I wanted a recipe that didn’t require an overnight sponge or two rising times. I wanted a recipe that could be done in just a couple of hours and have good texture and great flavor. The recipe had to be versatile and most of all, fun. First is the recipe as I made it and after, is a basic recipe that can be modified easily to give you a whole bunch of different results. With practice, you could have these ready to eat within 2 hours. Remove the egg from the refrigerator and crack it into a bowl. Beat it slightly with a fork, set it aside to come to room temperature. Heat the milk, water and honey with the butter just until the butter melts. Cool until the temperature falls below 120°F then beat in the egg. Measure 2 cups of AP flour, yeast, and salt in the bowl of a stand mixer. On low-speed, add the cooled milk mixture until a dough forms. Slowly add the remaining flour a bit at a time. The dough will pull away from the sides of the bowl and will not be sticky when enough flour has been added. You may need to add additional flour beyond what is called for in the recipe. Once a soft non sticky ball has formed, knead for 5-8 minutes until smooth and elastic. Zero a scale and weigh the dough mass. Determine how many ounces of total weight you have. You can determine how many rolls to make in one of two ways. 1. Divide the total weight in ounces by how many rolls you need. Then cut off dough balls that of that weight and all rolls will be the same size. 2. Decide how large you want the rolls. 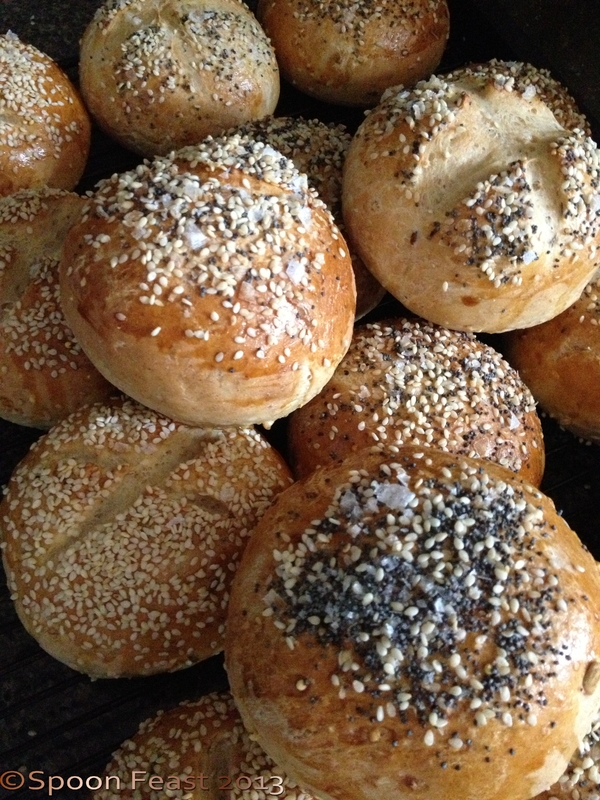 The rolls featured are 3.2 ounce dough balls. As the dough balls are weighed, round each dough ball to create a smooth top. Place them 3 inches apart on a parchment lined baking sheet. If desired, sprinkle a bit of cornmeal under the rolls. Place the smooth dough balls onto the prepared baking sheet, cover with a piece of plastic wrap that has been sprayed with non-stick oil. Let the rolls rise until they double in size – in a warm kitchen this may take 30-40 minutes. 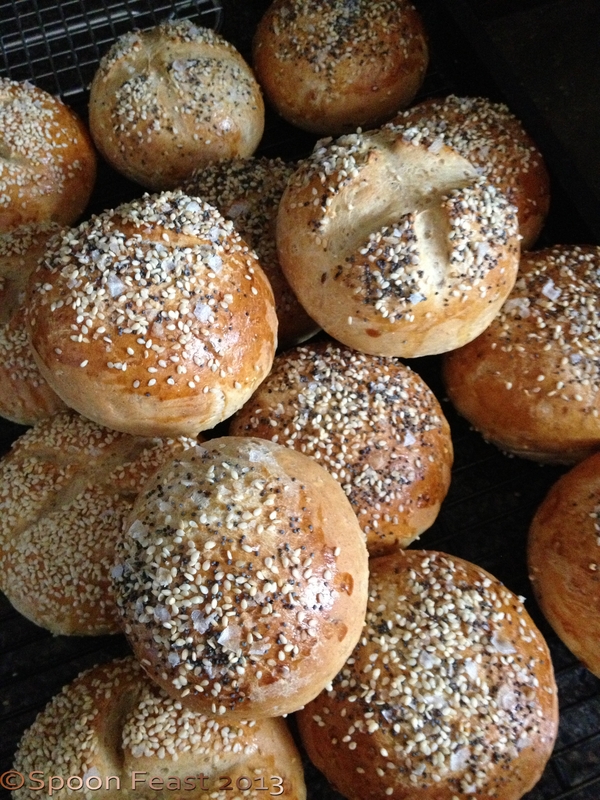 Once the rolls have risen, glaze them gently with egg yolk and sprinkle with seeds. The egg yolk helps the seeds stick and gives a nice shine to the finished roll. Brush the egg yolk on with a brush, being careful not to deflate the risen roll. Bake the rolls in a 400°F oven for 12-15 minutes; 10-12 for the small rolls and up to 20 minutes for the larger rolls. Verify internal temperature has reached 210°F and then cool the rolls on a rack. Be sure to space them so they don’t become soggy while cooling. The final internal temperature should reach 210°F for any size. Once the rolls have cooled, slice them open and fill with your favorite sandwich filling. The rolls are tender, absorbent to hold juicy fillings without getting messy, taste really good and look fantastic. Once you see how easy it is to make these sandwich rolls, you’ll make them again and again. 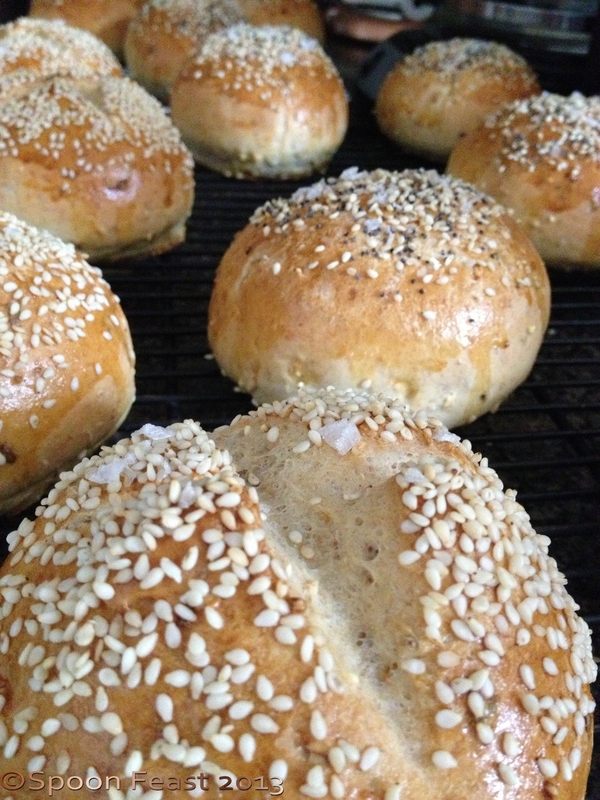 Follow the same directions as the multi-grain rolls. Use different toppings or slash the tops of some rolls for different looks. If you use dried minced onions or dried minced garlic on the top of the unbaked rolls, be sure to soak the dried onions or garlic in a small amount of water before using as a topping. If they are not hydrated, they will burn and taste bitter. Try adding cheese or shredded zucchini in place of butter to the recipe. Use them as dinner rolls, give a bag to your neighbor. To me one of the best parts of a sandwich is good bread. This is a great start. Try them and let me know what you think and if you tried anything different. This entry was posted in Baking, Breads, Recipes and tagged Butter, Dough, Egg yolk, Flour, Ounce, quick sandwich rolls, sandwich rolls, Tablespoon. Bookmark the permalink. Good Luck on your exams! Eat these rolls for carb energy. I made these today in under 2 hours. I found some shortcuts – melt the butter and whisk it into warm milk, then whisk in the egg. Measure the dry, add the wet and knead in a mixer with a dough hook for 5 minutes. Weigh out the rolls, shape rise 30 minutes, bake 15 minutes at 400 and you’ve got fresh rolls. I do hope you try them! These look fantastic! I can make pizza dough with confidence but am still a bit intimidated by bread… However these look tempting enough to take the plunge! Take your time and follow step by step. I’m sure you’ll be successful! Please let me know if you try them and how they work out.